Reverse Engineering, Generative Design, and 3D Printing are all approaches engineers can use to design faster and better. Yet, in each case, they must deal with Mesh Geometry. This eBook highlights new technologies that can help. What is MCAD?, What is Mechanical Computer Aided Engineering (MCAE)? 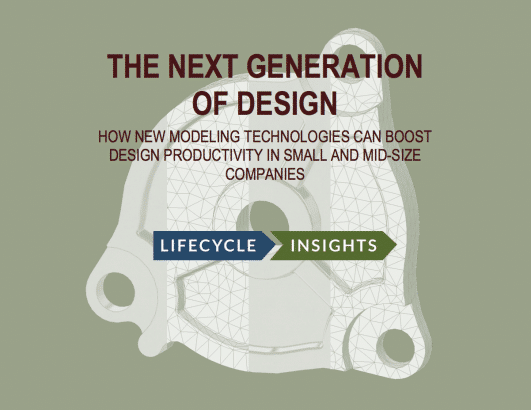 This eBook is of most value to engineers in small and mid-sized companies looking to leverage Reverse Engineering, Generative Design and 3D Printing. Time is at a premium for today’s engineers in small and mid-sized companies. Quite literally, there is simply too much to do. You bear the full weight of design responsibilities. You have to work with customers, suppliers, and partners. You must spend time on the manufacturing floor to identify and resolve outstanding product issues. The list goes on and on. When an engineer sits down at a desk, they must be highly productive. One of an engineer’s primary responsibilities is to build the digital geometry of their designs. It lets them check form and fit. It is essential for analysis. It helps generate the toolpaths that drive CNC machinery. It is used to develop drawings. Design geometry is the spring from which many downstream activities flow. Productivity in the production of design geometry has recently increased dramatically. Parametric Modeling lets engineers meticulously capture design intent with dimensionally controlled features, enabling faster and intelligent changes. Direct Modeling lets engineers push, pull, and drag design geometry quickly and easily. Both modeling approaches have served engineers well. Unfortunately, the productivity of some design activities has not advanced. Efficient support of reverse engineering, where existing components are digitally scanned and saved as mesh geometry, is still sorely lacking. Generative Design, which leverages methodologies for computer software to generate design alternatives, outputs mesh geometry. 3D Printing activities, which likewise rely on mesh geometry, also need modification. All three activities utilize faceted data, yet Parametric and Direct Modeling do not work with this kind of geometry. Nevertheless, the technologies needed to work with mesh geometry do exist. Facet Modeling lets engineers fine tune the quality of the mesh and add or remove material. Until lately, the primary problem was that the combination of Parametric, Direct, and Facet Modeling had not yet been combined into a single Computer Aided Design application. Because of this, engineers had to move geometry back and forth between these separate software tools. This resulted in translation errors and required users to learn multiple application interfaces. As such, these activities required laborious investments in time, and engineer’s productivity dropped. Fortunately, new solutions that address this shortfall are emerging. Some CAD applications have now integrated Parametric, Direct, and Facet Modeling into a single environment. These offerings promise to increase productivity for engineers in small and mid-sized companies. Exploring these topics at greater depth is the purpose of this eBook. Here, you will find more detail on the current challenges of engineers in small and mid-sized companies, the broader range of design activities that need support, traditional solutions and their drawbacks, as well as progressive solutions and their advantages.